New construction requires excavation. Areas around buildings newly backfilled and graded tend to settle and require grading for drainage away from the building. Example: Simple surface correction asisted with drain pipe in trench to carry water away from building. - The area along front entry off driveway has settled. - The sidewalk and surrounding area collect and hold water. 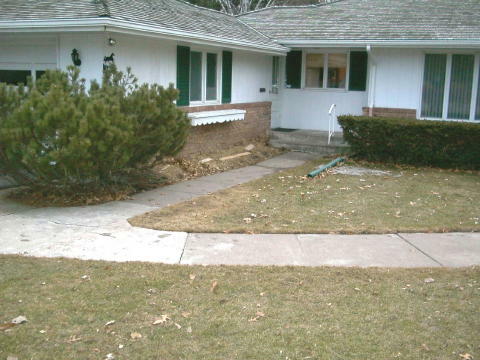 - The area is graded for drainage out to the front yard. - Sidewalk is replaced with a pitch for drainage away from the building. - Down spouts are connected to 4 inch corrugated solid drain pipe and emitted out by the street. This approach works well because there exists grade potential away from the building to street. 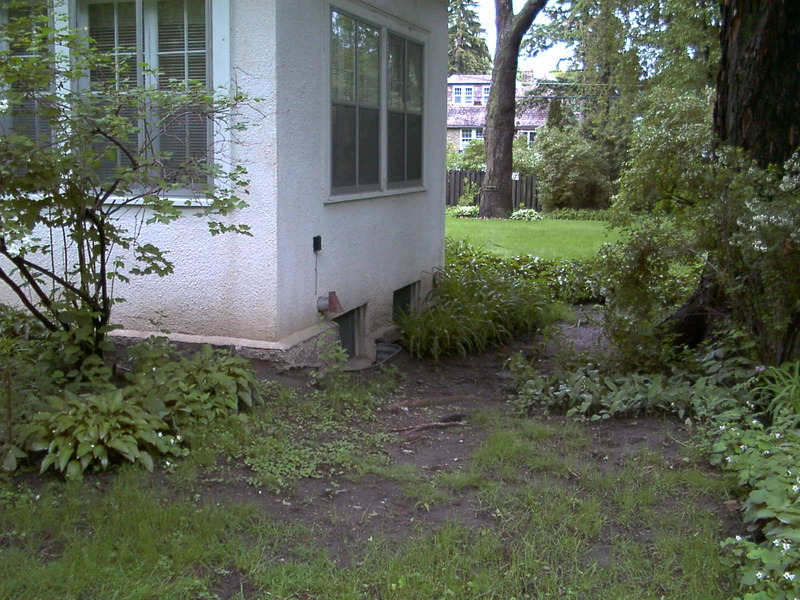 Example: Basement home with water problems along foundation. Surface water from rain, roof runoff, lack of drainage away from building, will find a way in concrete block and footings. 1 inch minus crushed lime stone is available in this area and was used to build the grade for drainage. Existing plants are moved out of the area. The area is graded for drainage. 4 to 6 feet out from house is built up and graded using the crushed lime stone product. Where crushed lime stone is not available, choose a base product. Crushed concrete is common. This products pack well holding a grade, and promote a water repellent layer. This is usually covered with 2 layers 6 mil black poly sheeting and landscape rock. Rock on poly sheeting provides erosion control and a finished look. 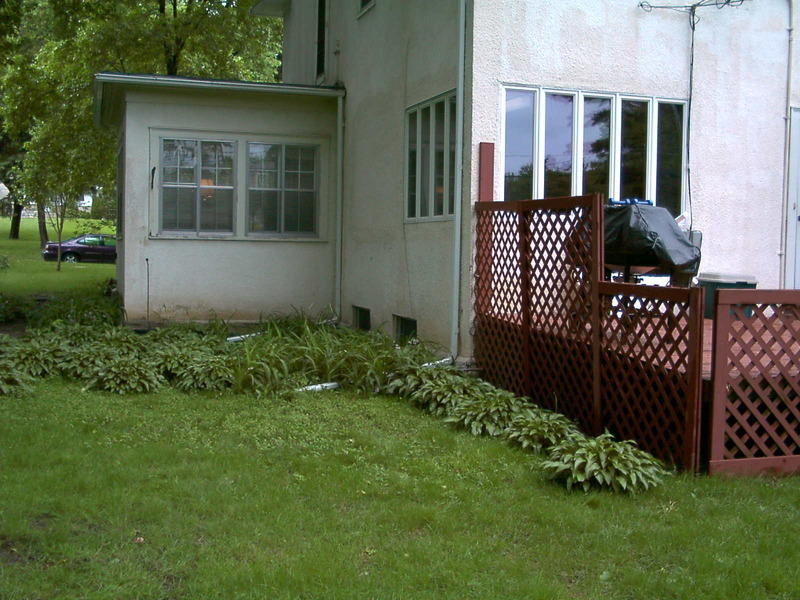 - Remove plants from area, saving wanted plants. An easy way to do this is put them on poly sheeting and drag them into shade. - Grade area for drainage way from building. - Any window wells in the area may need raising. To do do this usually require digging along the window well until it can be pulled up. Sometimes existing window wells are to short or decayed and replacement. Poly sheeting placed where window well makes contact with building helps keep water out. Back fill carefully. - Connect down spouts to 4 inch solid drain corrugated pipe. Down spout adapters are available for a clean fit. Big bosx home centers carry this stuff. Home Depot, Lowes, Menards. Window wells need to be raised at least 6 inches here for grading. The large tree contains roots that will prevent any trenching in this area. It is OK to cover up those tree roots. The tree trunk itself will prefer not have much if any grade change that piles against the tree bark. Tree types will react differently, generally, we don't want bark to rot. 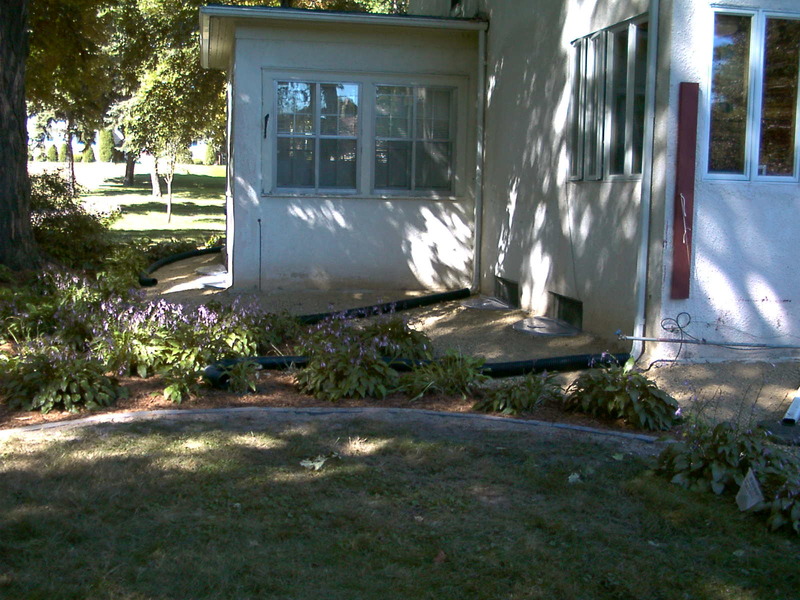 Water from the gutter down spouts collects and soaks the foundation and surrounding area. Concrete can and will decay over time in wet conditions. Plants placed back farther out from building and out of the important part of the grade job where rock on poly sheeting will go. We don't want grade for drainage away from the building and then dig holes for plants to be watered right inside the problem area. This provides a cleaner look anyway and access for painters, window cleaning and such. Here we install new window wells and re-grade with our drainage correction material. The material is compacted in and graded for drainage away from the building. Install decorative concrete border edging. Gives a nice clean low maintenance look. 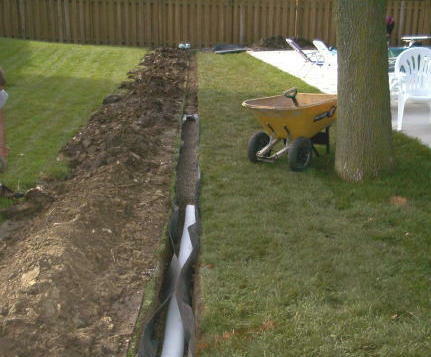 Normally the drain pipe is buried and routed as far as possible before termination with an emitter. This home had no grade to the street, and had to drain to the rear of the property. Here there is a very large tree with lots of roots that would have to be cut for a trench. Too many roots. The tree roots do hold the tree in place. Also the home owner wanted to move the pipe around for watering purposes. When we do cut tree roots, we use a saws all with an AX blade. AX is brand of wood cutting blade for saws all tools. Down spouts hookup to drain pipe. The drain pipe is terminated in the yard with a drain pipe emitter designed to allow water to exit and keep out debris and critters. A re-grade usually involves removing existing earth around the building and replacing it with our drainage correction material. Many times we will have to install new window wells for the new grade. Drainage correction material is an aggregate product with fine from crushing mixed in. 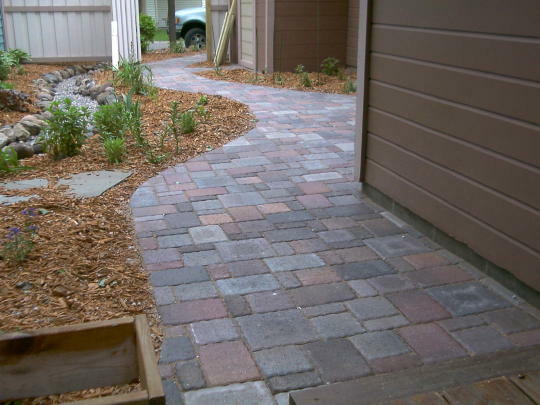 Product like this is also used as base material for patio pavers, retaining walls, road base. Anywhere a compactible material is required. 1 inch minus is a typical description. The minus is the crusher fines. Crusher fines in the product packs tightly forming a water repellant non-absorbing layer. This material forms good surface drainage correction and is ideal for re-grading around the house. A product installed to a sufficient depth (6 to 8 inches) will help block water from soaking in along the building. This type product also holds it's grade better. Wet soil, sandy soil, clay tend to heave, settle, not hold grade. This grade job will not want to be planted. Planter starts along the outside edge. The grade job can be protected with 2 layers 6 mil black poly and mulch or landscape rock ground cover. Poly sheeting can be purchased wide enough to create 2 layers by folding. Place fold along building. Leave 4 to six inches, or more extra against building. Ground cover install will shorten this up. Extra can be folded under or up the wall depending on amount of ground cover. Folding up the wall works well where vinyl siding allows tucking behind the siding. 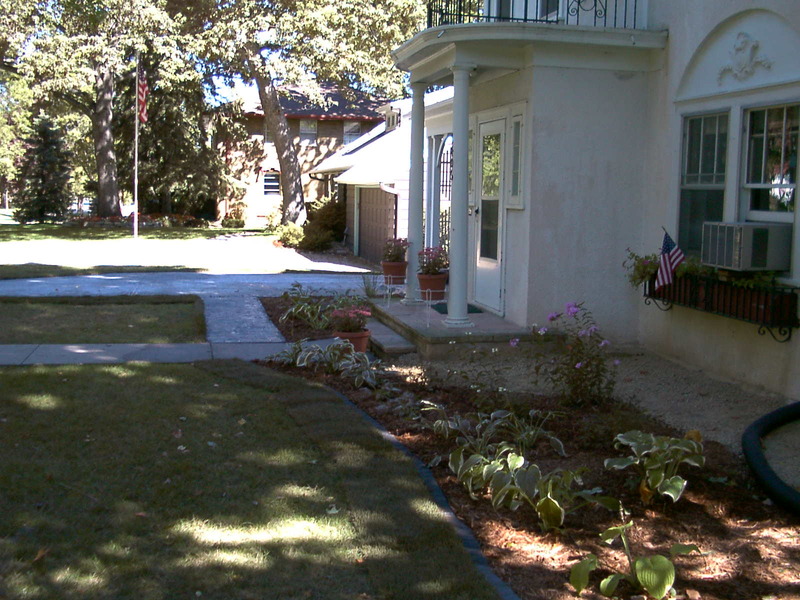 A re-grade with drainage correction material is topped with 2 layers poly sheeting and river rock ground cover, and solves most surface drainage problems around the house. Drain tile refers to different types of product which assist water movement. Most common will be 4 inch corrugated black plastic pipe. 3 inch pipe is available but it is too small for most uses. Corrugated drain pipe is available in larger diamater size than 4 inch. 6 inch is common. 4 inch is used the most for residential needs. Corrugated drain pipe comes as a solid pipe (no perforations). Used off down spouts and areas where water needs move without draining. Corrugated pipe is available as peforated pipe. This allows water entry into the pipe. When using perforated drain pipe: Get with a SILT SOCK OR IT WILL CLOG... We rep[lace alot of cloged drain pipe. Silt socks come in white or black. Perforated drain pipe is usually available with the silt sock already on it. If not in you're area, silt socks are available separately. Drain tile installed properly allows drainage where a surface drainage needs an assist. Example: Using perforated drain pipe in silt sock to drain and move water. Perforated drain pipe assisted with French Drain technique. 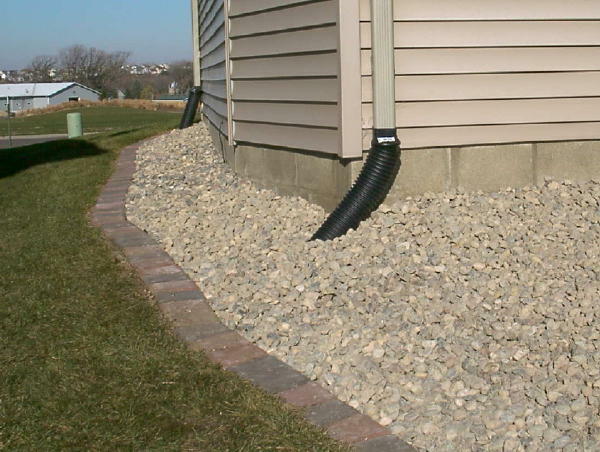 French Drain normally refers to a rock filled ditch or trench. The dirt from the trench is placed on 4'x8' plywood sheets. This protects the lawn and eases backfill. -Note: Approximately 1/3rd of the excavated fill from a 16 inch depth trench will need be hauled out of the area. Drain pipe here is 4 inch perforated in a silt sock. 16 inch trench depth is minimum for a robust install where grade allows the depth. If not a sufficient depth, the pipe will make it's way to the surface. 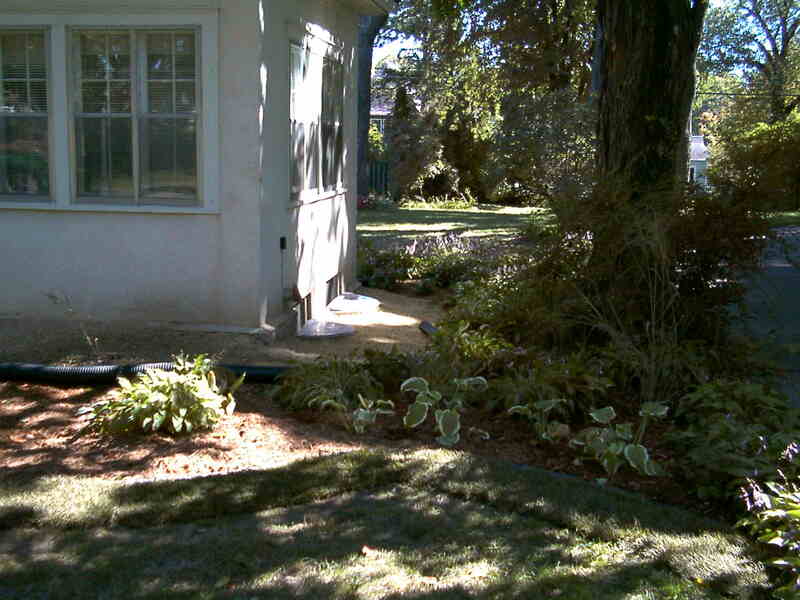 This trench is lined with landscape fabric and a few inches pea gravel placed in trench before the drain pipe. Trench is filled part way with more 3/8 inch drain gravel. The drain pipe in silt sock needs be held down while back filling the trench. 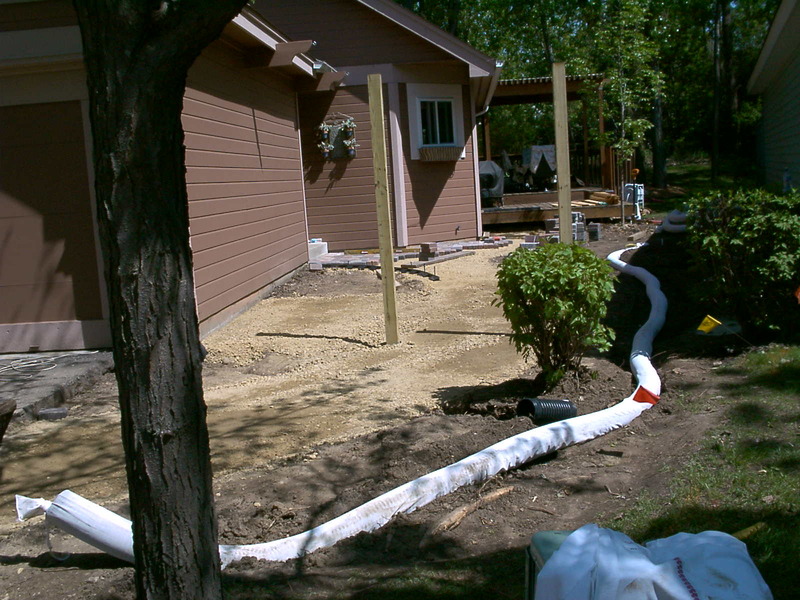 When the pipe is covered with drain gravel, fold fabric over top and continue back fill with excavated soil. This trench will get sod on top. Reason for the gravel assist here is faster water entry into trench, AND more water capacity in trench. This area of lawn is down hill with a pool at the bottom. Water needed to be caught and routed away under ground because even though a slight valley exists between hill and pool, water would not move quickly enough with the lack of grade. Water was pooling and running into the pool. People with pools know that dirty water and cleaning gets time consuming and expensive when needing to be pumped clean. Example:Perforated drain pipe in silt sock, at bottom of French Drain. French Drain disguised as dry stream bed. We call this a feature. 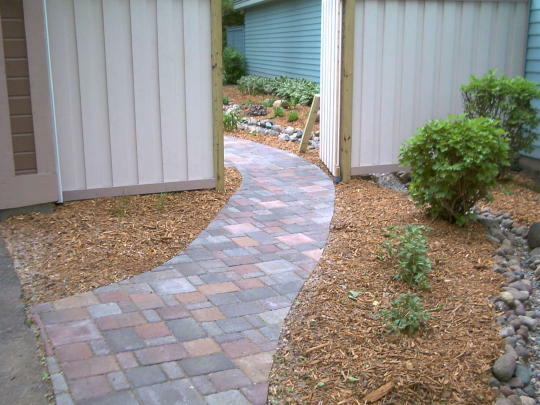 Drain tile and a French Drain combined add a natural look for the smaller garden yard with a flat grade. Here we were able to dry up a wet location and add interest. More photos of this job can be seen on the paver walks page on decorativelandscapes.com. 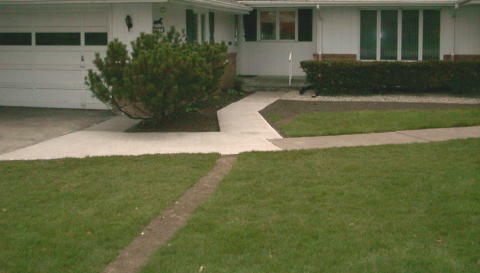 We didn't have room on this job, but where space is available, this water path can lead to a rain garden. 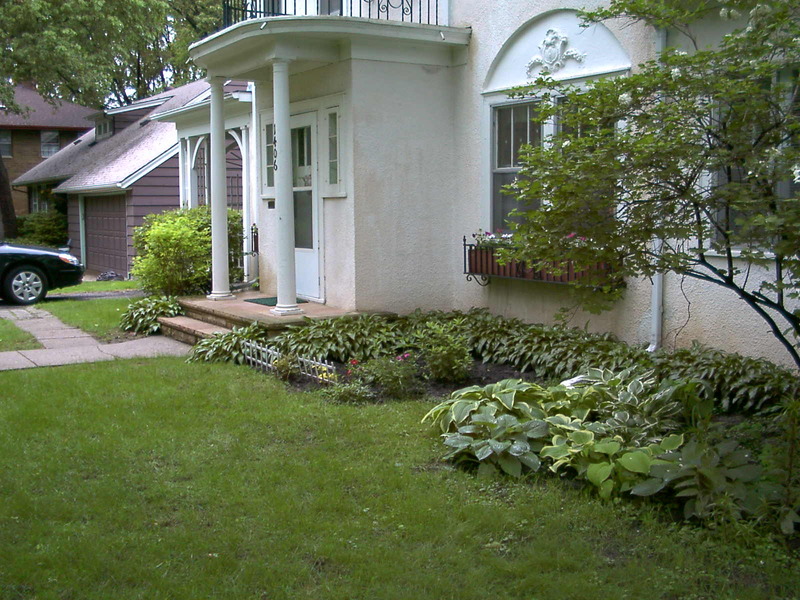 A rain garden is a small holding pond which provides a place for at least some water to collect and soak into the ground, rather than all run off onto the street. In a way, the rambling stream bed is like a rain garden. 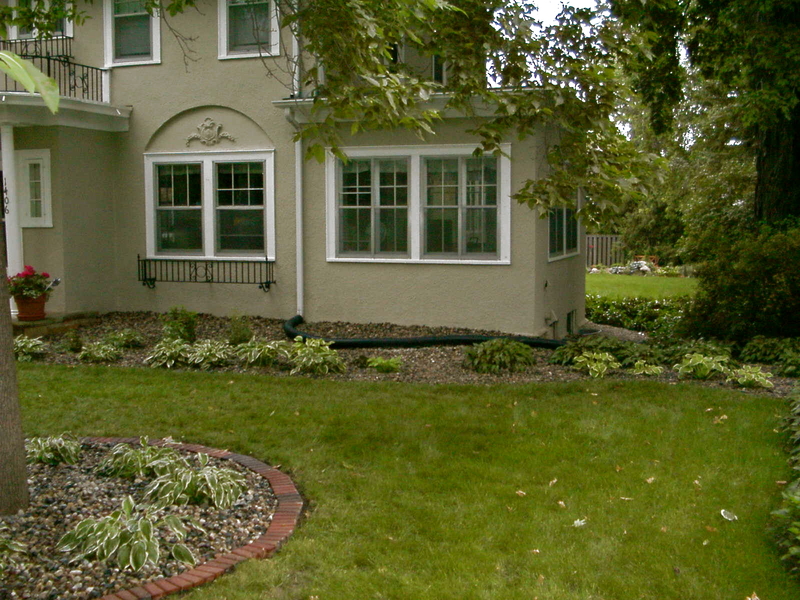 Rain Gardens provide an opportunity for a variety of growing conditions along the sides and bottom. 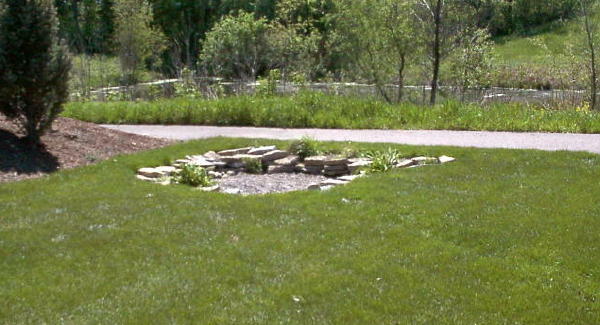 A rain garden can be constructed as simply as excavating a shallow area 4 to 16 inches in depth, covering with landscape fabric, optional rock ground cover. Mulch will float away. Planting is the same as any other. Vertical sides can be used with natural stone wall rock. We like to have the entrance shallow. Normally we are routing water from other areas with perforated drain pipe under ground. Where a grade already exists, a slight re-grade may assist water towards the rain garden without the need for drain tile. Grade potential is the verticle drop beween area we want water runoff and where we want water to go. Grade potential is what we have to work with, and dictates the extent of drainage correction required. A transit is a must when working with tight grades. This job had about 8 inches grade potential from back to front. The back went up hill, the front was the only option for draining property. 8 inches is not much over about 150 feet back to front. 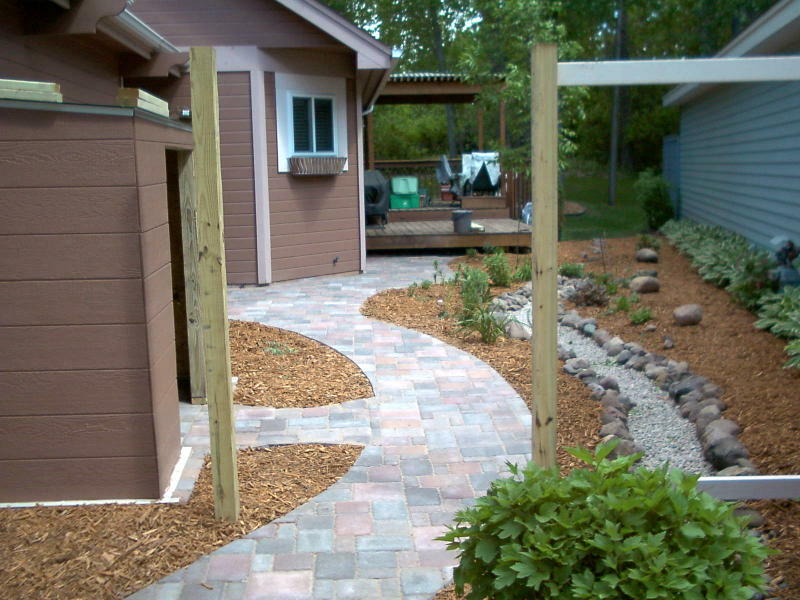 The paver sidewalk connects the driveway to the front entry and ends at base of deck steps in back. 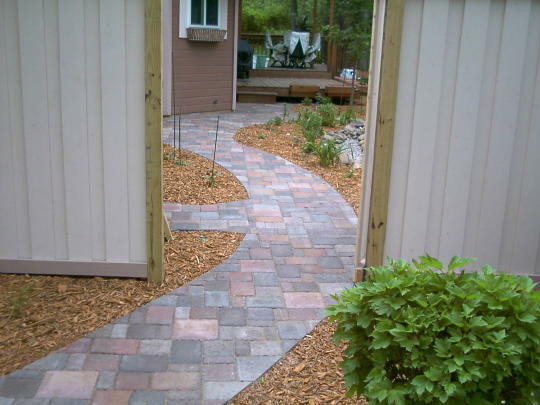 The paver sidewalk sets the grade from back to front. Looking at the photos; the base for the paver sidewalk was graded meticulously. Again: A transit is a must when working with shallow grades (low grade potential). Installing the new sidewalk made the drainage results that much more robust. The pavers are installed on a compacted 6 inch depth crushed limestone base. Any less base would not be adequate in any area. They wanted a new paver sidewalk anyway, so perfect oportunity for drainage correction. 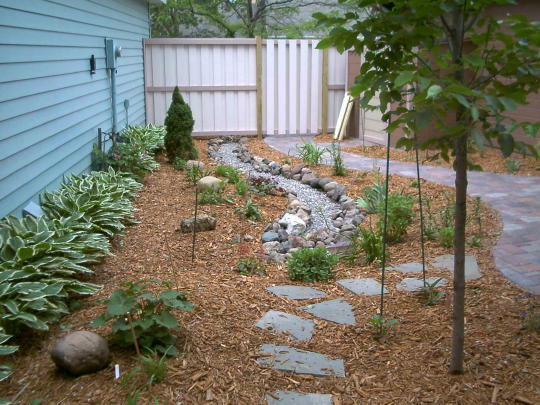 A rain garden can be constructed as simply as excavating a shallow area 4 to 16 inches in depth, covering with landscape fabric, optional rock ground cover. Mulch will float away. Planting is the same as any other. Vertical sides can be used with natural some wall rock. We like to have the entrance shallow. Normally we are routing water from other areas with perforated drain pipe under ground. Where a grade already exists, a slight re-grade may assist water towards the rain garden without the need for drain tile. Grade Potential influences drainage correction solutions. High Ground Water can slow or even prevent drainage. Wet season / Dry season. Low areas with high ground water have low to no Grade Potential. Rainfall amounts vary. Many times, it is only the biggest rain fall totals that cause water problems. Surface drainage. Grade does not allow for water runoff quickly enough or not at all. Water shed from adjacent property coming onto property causing problems. Need to extend discharge from pool, sump pups etc.